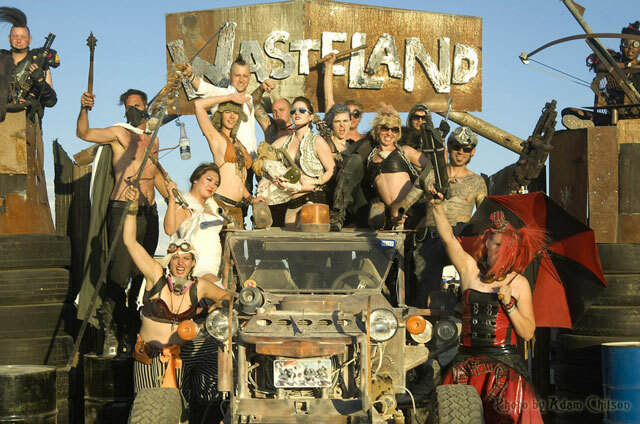 Described as “the world’s biggest SOLELY post-apocalyptic party”, Wasteland Weekend is a 3-day Mad Max inspired adults-only event that takes place in the California Mojave Desert outside of Los Angeles. Now in its third year, Wasteland Weekend 2012 takes place September 27 to 30, 2012. Check out their promotional video titled The Fission Family which is a fun 1950s-style animation announcing the event. Tickets are available to purchase now. ..at Wasteland, you must wear a post-nuke-friendly outfit at all times. No bystanders, no spectators. In addition to those that go solo just to soak in all of the Mad Max craziness (bands, DJs, stunt performers, modified cars, fire performers, burlesque dancers, etc.) more and more attendees are forming tribes. A tribe caravans to the event together, creates their own signature theme, and often their own post-apocalyptic campsite, and vehicle(s). Tribes have begun forming all over the U.S. (and beyond) based on anything from a characteristic style from a particular geographical location (like this Las Vegas-based tribe), to their own strange fictional back story, to replica themes (tribes based on the Fallout game series, or cult films like Blood Of Heroes for example).